Ghee rice| Nei Choru| Ney Choru is an easy to prepare variety rice which goes well with vegetarian as well as non vegetarian like (Pepper chicken) side dishes. It is quite simple to make dish dominated with the flavour of ghee and garam masala. It is generally prepared for festivals or family or friends gathering or weddings as it is simple as well as a rich versatile dish. I usually serve this dish with Pepper chicken for non vegetarians and for vegetarians with Kurma. Pepper chicken compliments very well as it is a spicy dish. I prepare this dish whenever i feel lazy to prepare Biryani or Pulao. Check my other Rice Recipes in this link. Heat 1/4 cup of ghee inside the pressure cooker and add cinnamon, cloves, cardamom, bay leaf, star anise and jeera. Once they fry in oil and starts to give the aroma add the onion and green chillies with a pinch of salt. Once the onion becomes translucent add the ginger garlic paste and cook for fifteen seconds to leaves the raw flavour. Drain the water thoroughly from the rice and add inside the pressure cooker. Add some salt and 4 and 1/2 cups of water (use boiling hot water to save the cooking time) and mix and cover it with the lid and keep the weight on it. Cook for 2 whistles and switch off the gas. In a separate pan heat a tablespoon of ghee and fry the chopped onion till golden crisp. 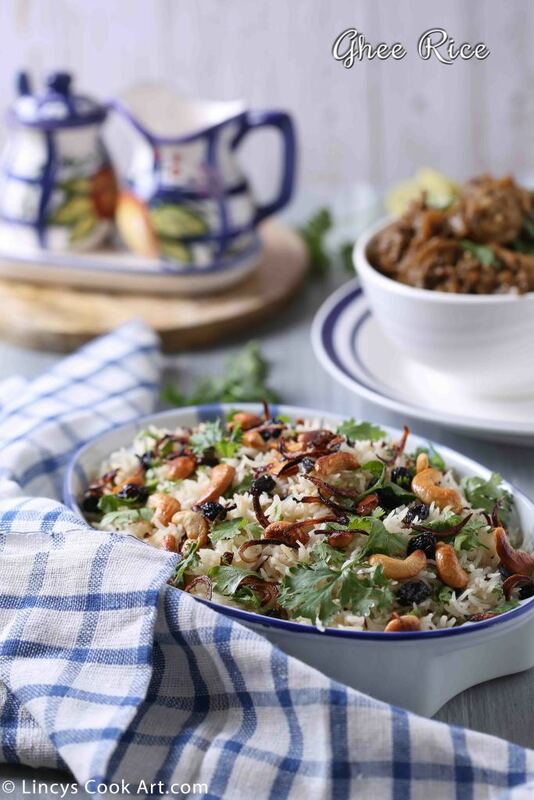 Open the pressure cooker and sprinkle some coriander leaves; now add the fried onion, cashews and raisins with the ghee. Add a teaspoon of fresh ghee for more flavour and mix gently without breaking the rice. Note: You could follow the same procedure for huge quantities. Instead of pressure cooking, cook the rice separately with salt and mix once the the onion and ginger garlic cooks well.